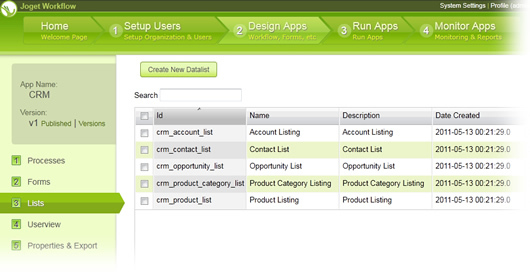 When we talk about building an application, what are the most commonly needed UI components? 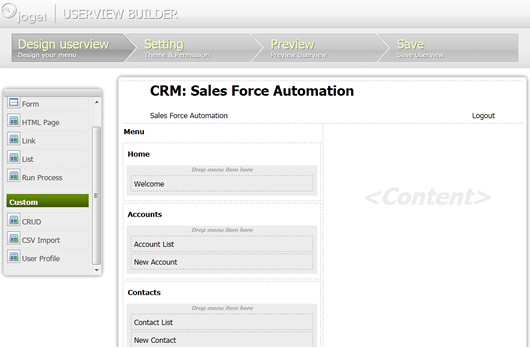 For example, in a CRM application, we would undoubtedly need to have features for Contact List, Opportunity List, Account List, Product List, etc. Then, at the same time, each of these listings would need to have the standard CRUD feature. In Joget Workflow v3, we can easily create a datalist from a customizable set of columns, filters, and actions. This powerful new feature allows users to not just design and automate processes, but to build real web applications too! 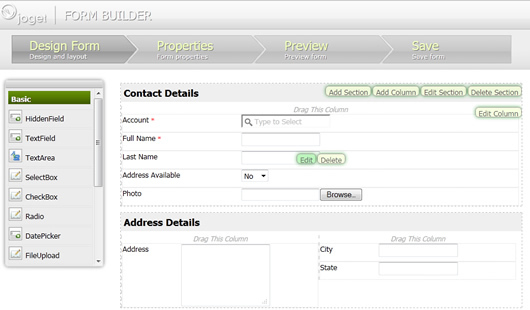 Flexible grid layout to allow any form of UI arrangement. Wizard-style property dialog for all form elements. Support for form element extension using plugins, which means we can easily enjoy the availability of a new form element, just by installing a plugin. Support for configurable data binders to load and store data. In other words, we can configure to load data from, and store data to, a default or any other external datasource. Fully web-based, no client-component installation required. And the good news is, all these standard UI requirements for a frontend website are available out-of-the-box in the new Userview Builder! So again, please allow me to repeat: with Joget Workflow, we are not just designing and automating processes, but building web apps too! Simplicity redefined. Not a single line of programming code to be written, from designing processes to creating a complete web app! Further simplified interface. Based on user feedbacks, redundant features that led to confusion in the previous version have either been simplified or removed. Easy-snap which makes it much easier to insert and connect the objects. Intelligent context guide to advise users of any mistake spotted in the workflow design, and subsequently offer suggestions to correct those mistakes. sounds interesting! we will have lot to share as soon as this is out!! Hi when will joget v3 release? Hi Palmers, v3 Beta will be available pretty soon. Within 2 weeks. Stay tuned to @jogetworkflow on Twitter or /jogetworkflow on Facebook for updates. When will the stable version 3? @DeuFon It may take about 3 months from the release of Beta, to allow enough time for existing adopters to test the software and feedback on the issues. 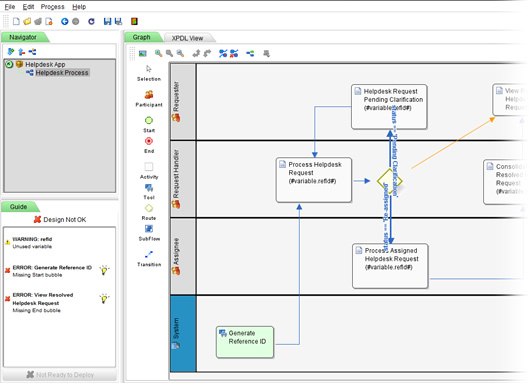 in the new version 3 will be a compatible with bpmn 2?? in V3,this code "FormManager formManager = (FormManager) pluginManager.getBean("formManager");"
Joget is using XPDL 1.0.